We all know and love them: The Foretellers of the [X]chi-Series. Aced, Ava, Gula, Ira, and Invi - all of them are mysterious. We know little to nothing about them. But there is one who stands out the most - Invi. Besides of having a minor role in KINGDOM HEARTS: [X]Chi compared to the others (seems like she is hiding! ), she has one little detail that makes her even more mysterious: She is not only wearing a mask, she is covering her mouth, too. Fans have been wondering about this since the start of the browser game. But I couldn't find many theories about this, so I figured: Why not create one myself? A person who is covering their mouth is often represented as a liar: As if they're trying to prevent the deceitful words from being said. A mask is usually used to conceal emotions. Invi is both lying and concealing her emotions. What if she isn't who she pretends to be? Or, to be more direct: what if she is the traitor? She was talking to a person wearing a Black Coat. I don't think we know who this person is: Luxu or the Master of Masters. If the BC is Luxu, she might have taken down her cloth and revealed her "true self" (as the traitor, maybe?). If this were the case, maybeLuxu and Invi were forming an alliance secretly? As Ava stated in the trailer, alliances are forbidden. Both of them seem to be alone in the room. If the BC is the Master of Masters, she might have taken it down out of respect. She seems to trust the sayings of the MoM - what if she revealed her face only to the MoM? Actually, what if the MoM knows Invi is the traitor? What I'm trying to say is: All of this might be a plan of the MoM and Invi. What if that's the reason the page is gone from all of the copies? In the same trailer, Ava seems to be confronting Invi, telling her that her actions will be making things worse than they already are. On the cover of II.8, you only see the noses of the MoM and Luxu --> their mouth is covered, too! Right under Luxu is Invi, whose mouth is also covered! I feel like this is supposed to be a hint. This much can't be a coincidence! I don't know but I feel like everything is pointing at her being the traitor so obviously that I'd be kinda disappointed if she actually were. Like...yeah, who wouuuuuuuuuld've thought. There's one thing that bothers me a little about all the traitor theories I've seen so far, and it's how they tend to gloss over WHAT exactly the character is betraying. Is it the mission to save the worlds? Their fellow Foretellers? The agreement that they would follow the MoM's instructions? Or could it all be a fabrication and the "traitor" was no more than some unwitting pawn who ended up screwing over the world on accident, like how the Book of Prophecies seems to be implying? I like how you suggested that having a collaboration with Luxu could be going against the "no alliances" agreement they all made, but at the same time, I feel reluctant to accept any traitor theories til we actually know WHAT makes the traitor a traitor. Well, nobody can theorize about what the character is actually betraying because I feel like we have too little information about them. Thanks, I'm glad you liked that part. i always assumed "the traitor" implied someone who was orchestrating the end/sabotaging the other foretellers for the Lux, but i haven't put much thought into it one way or another. And this has relation to what exactly? I never mentioned anything of the kind, so this is kinda nonrelevant? Also, explaining who the Foretellers really are is still intact with my theory, lol? Yeah, but I feel like all of that is self-explanatory, kinda? We need those theories to be able to feel alive while waiting for 2.8. I don't think Invi is the traitor. I don't think any of them technically are. I'm of the opinion that she's lowered her mask out of respect for MoM. The meaning of 'traitor' is probably just as vague as their mission of 'gathering lux' or 'protecting the light'. They all have their own idea of what 'protecting the light' means, and they all probably have their own idea of what constitutes a traitor. - Gula could see Aced as a traitor cause he's always so agro on them. If Invi were the traitor, then that could make the MoM and Luxu traitors too. It seems to me that the Master and Luxu have accepted what will happen. A war will break out and end the world. If Invi 100% believes the Master's word, then she too would probably allow certain things to happen or even encourage them to. Well, idk, seems like a possibility, I guess? @kira, I like your thoughts! I actually think Ava is the traitor. The prophecy said something along the lines of "You will go out on your own and disobey my predictions" and the Master of Masters predicted that the final battleground would be the Keyblade Graveyard where every Keyblade Wielder would be fated to die. But, Ava went ahead and disobeyed the prophecy and gathered the Dandelions, fulfilling the traitors prophecy. It also explains why she was so angry with Luxu when he revealed the truth; she was in so much disbelief and confusion she lashed out at him, now knowing she was the traitor. Also, if you think about it, if every Keyblade Wielder DID die during the Keyblade War, I don't think anymore Keyblade Wielders would've been anointed, thus no Master Xehanort and his plan to hold another war. Yeah, I've been looking for that, but I can't seem to find it. But I do know for certain that was quote. I'm with everyone else with the abstractness of who the traitor truly is and why they're considered as such. It's hard to point fingers with who the traitor is if we don't know what the guidelines are, however, there is one interesting thing to point out with the Master of Masters, Luxu and Invi... the Chimera theory. For easy reference, here is what a Chimera is (for those who don't know). At first glance, it's hard to understand what this mythical creature has got to do with the Fortellers, but upon deeper inspection, it makes thematic sense. The Chimera is a Lion + Goat + Snake. Seeing as all the Fortellers and Master of Masters are based of the Seven Deadly Sins and their respective animals, we've already got the snake represented by Invi and the Goat represented by Luxu. It's a no brainer that the Master of Masters is the leader of the pack and Lion's are almost always symbolised for leadership: the head of the Chimera. I'm with everyone else with the abstractness of who the traitor truly is and why they're considered as such. It's hard to point fingers with who the traitor is if we don't know what the guidelines are, however, there is one interesting thing to point to point out with the Master of Masters, Luxu and Invi... the Chimera theory. For easy reference, here is what a Chimera is (for those who don't know). At first glance, it's hard to understand what this mythical creature has got to do with the Fortellers, but upon deeper inspection, it makes thematic sense. The Chimera is a Lion + Goat + Snake. Seeing as all the Fortellers and Master of Masters are based of the Seven Deadly Sins and their respective animals, we've already got the snake represented by Invi and the Goat represented by Luxu. Thank you so much for posting this, it got me thinking! 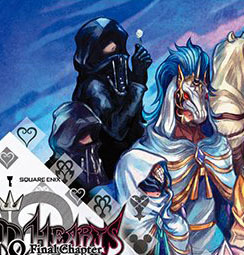 On the cover, you only see the noses of the MoM and Luxu --> their mouth is covered, too! Right under Luxu is Invi, whose mouth is also covered! I feel like this is supposed to be a hint. Or I am reading too much into it, but come oooon, this much can't be a coincidence! Invi seems too kind to be the traitor. And a lot more evidence points towards Ava or the MoM being the true traitor. But Invi being the traitor makes some sense, like how she leads a Union based on a snake. A creature that is basically the poster child of lying, and that is a bit strange. As the Foretellers all have something similar to that animal. Ira is...I guess mythical or honest like a Unicorn? So the fact that Invi shares almost no similarites to her animal, other than name and mask. Something strange is going on with her, but I doubt it is traitor or THE traitor. How do you get the impression that Invi is too nice when she's got like 5 appereances in X? Like, I'm curious.